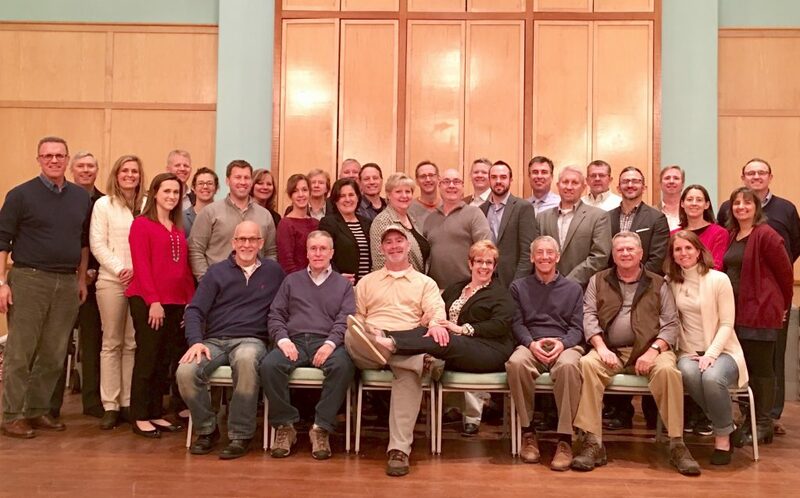 Since I’ve been on Council and for a number of years before that, the Cary Town Council and Town Staff have taken a few days every year to pause and plan for the upcoming year. 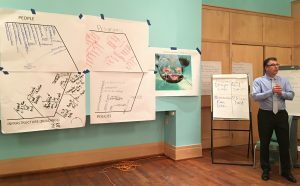 It’s especially helpful for us to truly step back and away from our day-to-day activities (literally and figuratively) for this extended period of concentrated discussion, dialogue, and strategic thinking about our plan for the future and to deep dive on a number of specific issues. 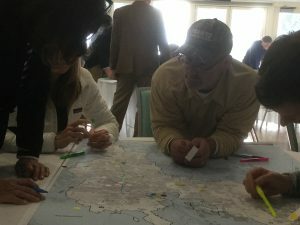 Often, we take advantage of the location as well, meeting with elected officials wherever we are, sometimes seeing the surrounding area and getting a taste of how they have handled challenges, locally. I’m sure that Councilman Don Frantz and Mayor Weinbrecht will also blog about their views/experience, but I thought I’d take a different path, and share my experience. 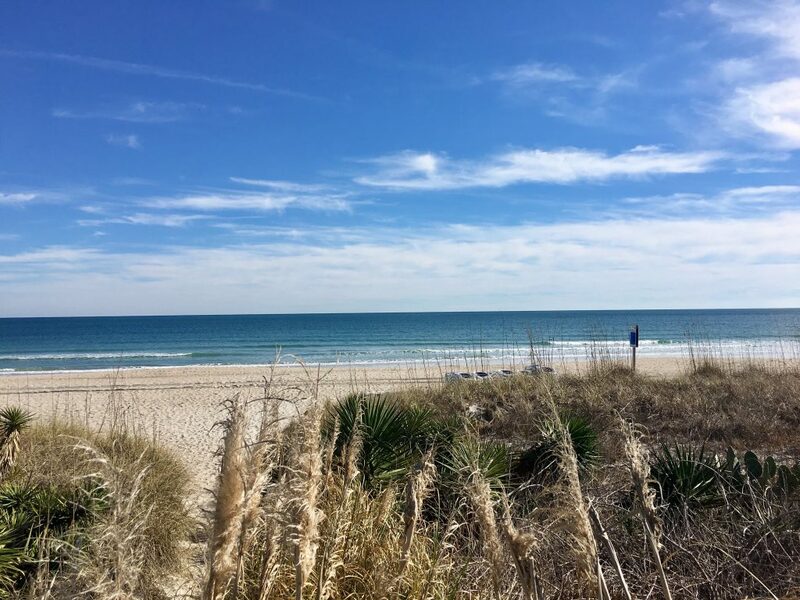 Don and I drove together to Wrightsville Beach on Thursday afternoon – there are probably some folks that might find that interesting, or maybe surprising. One of the best things about my relationship with Don is that although, ideologically, we are very different – we are more similar in so many ways. We both respect each other, believe each is a person of high integrity, enjoy each other’s company, and both love Cary. With that as our friendship foundation, the rest is just gravy. I learn a lot from Don and his perspective, and the opportunity to have 2 hours in the car with him is one I wouldn’t ever pass up. Once we arrived, we had a “social dinner” with council – absolutely no “work talk” – so we could just spend time continuing to get to know each other. That connection is important – and one that I really treasure. I’ve never been to Wrightsville Beach before, but it was off-season, and a good locale for us to convene our meeting. I think I ventured outside once, right after lunch – so although we were “at the beach” I saw the beach from my window, and took a brief walk at lunchtime. Wrightsville has 2800 full time residents – that swells to 30,000 over the summer. Their police department is larger than average due to their needs in the summer, and of course they have to do beach replenishment every 4 years that costs about $10 million. Talk about some unique challenges. They also have an incredibly low tax rate – 13 cents with about 1/3 of their revenue coming from parking – almost $3 million. We had lunch with Mayor Bill Blair, and Mayor Pro Tem Darryl Mills and Alderman Hank Miller, the other 2 Alderman were unavailable. We shared some of our experiences as well – as they are in the process of considering how to build new Town Chambers. I learned so much from our lunchtime conversation! That was the slide title, and I think a great kickoff on Friday to our day. We reviewed where we have been – from a suburban small town to a more established city, to where we are headed. We talked about how we’ve become a mecca for the young family, while also increasing our diversity. And, most surprisingly, we’ve gone from a bedroom community to actually an employment center. It’s true. More people COME to Cary to work, than leave. – Our town diversity is growing, from a minority mix of 18% in 2000, to 30% of our population now being a mix of Latino, Asian and African-American, with more than 15% of that being Asian. We spent time talking about how trust in our government has declined over the years. Using data from the Edelman Trust Barometer, and Gallup Poll information, we saw how trust in all types of environments has declined. There are lots of reasons for this decline – some has to do with employment rates, others to scandals like the Flint Water Crisis, and some to events like “Bridge-gate” in NJ. When it comes to trust – we don’t do so well in NC – we rank 43rd in Trust – with only 51% of respondents in NC who trust their state government. And this was BEFORE HB2. Hey, we aren’t the worst. Illinois is at 25%, and North Dakota is really happy at 81%. Probably not surprising to you that Americans in general, are still more trusting of their Local government than State – about 71% to 61% on avg. Since 1999, the Town of Cary has collected our own data, to see how you feel when it comes to trusting your government. We do this by asking you what you think, every other year, with our Biennial Citizen Survey Report. We care about what you think, and we do our best to proactively address your concerns and stay on top of emerging trends. We’ve been doing pretty well there – you all gave us high marks. We looked at our past Bond Referendums – and how those have passed, or not, and the percentages – remembering that all of our bond referendums in the past, (excluding 2012), were without tax increases. Our goal is to maintain the valued trust you give us, and to ensure that we continue to reach out and involve you in our decision making process. We took a look backwards, again, to look at our tax rate, and used an example home built in the 1990’s, which was when we had a big building boom. We saw that, as you can imagine, buying a house in Cary has been a great investment. From 1993, to 2017, the taxes on that property have only gone up about $120 – not including the increase in appreciable value of that property. So, you get all the resources, like new parks, greenways, new fire stations, new roads, a senior center, the Cary Theater and Cary Arts center, for just $120 more in taxes. Now, I do realize that that home appreciated in value, and a lot of that is because Cary is a great place to live – and because of all of the amenities we provide. That means that you have also had a great return on your investment in Cary. – 33% of our sidewalks are at least 20 years old. – We spend $6 million/year to resurface about 5% of our roads – in 2011 we spent $1 million. We ended with a discussion on medians. 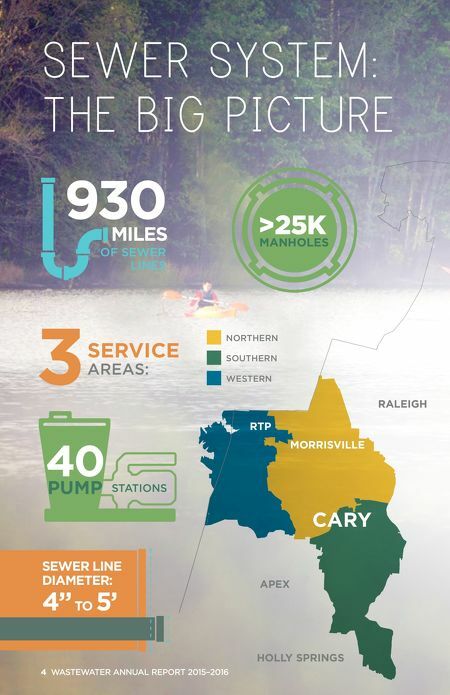 Overall, we determined to keep our plan – that our medians are just one of our defining Cary characteristics. Some folks said that there are two kinds of streets – ones that have medians, and ones that need medians. 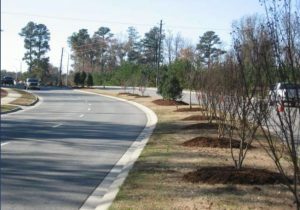 When it comes to medians in Cary, you might be surprised to learn that we have 43 miles of them in Cary, 20 miles of those are planted. The council’s determination is that they should be planted (when 6-8 ft or wider) and if they are too small to be planted (4-6 ft) they will be brick filled. Many of our medians today are maintained by HOAs – and that is because they were conditions offered by the developer at the time of the rezoning. We’ve worked hard to catch up and plant many medians that had been put on the “back burner” during the recession. Of course, there are costs to this – roadside maintenance is required – and that costs the town today about $1 millon/year – or about $20/household. So, after long day on Friday, we had a bit of a shorter one on Saturday. We did an exercise where we looked at where councilmembers and staff go about and around Cary. Allowing us to see what areas are seen by us all, what are favorites spots are, and where there are areas that some don’t see, much at all. It was interesting to see the various routes some folks take, and how a few of us see a lot of Cary, and how a number of us stay to smaller concentrated areas. After that, we looked at how Cary has matured. It’s good for us to review all of this so that we can ensure we address any relevant trends. There was a bit of consternation regarding the naming of what we were calling the AM Howard Farm. This was an item on a previous council agenda, that was tabled to the Retreat. A lot of good discussion – but we ended up with Good Hope Farm Park. The farm exists in the “Good Hope” area, which was news to me. I learned that Green Hope School was named that way – because it was between the Green Level community and the Good Hope community. Hence – Green Hope! 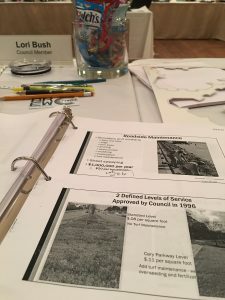 I was OK with the name of AM Howard Farm – since the farm had been there for 80 years – but there were good reasons to name it for the community, as well. – I want us to return to our “Technology Town of NC” innovative roots. We need to find new ways to leverage and enable technology to reach our citizens, engage and share. – I still have a pet peeve when we change road names, right in the middle of the road. It’s confusing for our citizens. – Branding at the Town. We need it. The Town Seal is not our brand, and its use is protected. 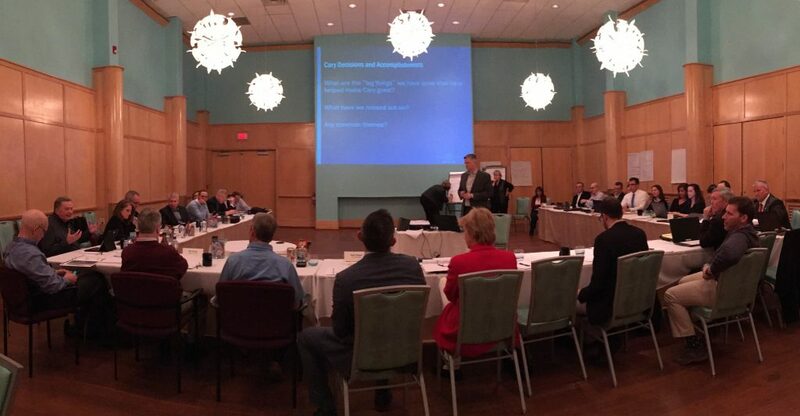 We need a way to share what’s great about Cary – for economic development purposes, and more. – Bicycle and Pedestrian safety in Cary and our surrounding area is a deep concern. As you all know, we have had deaths and significant accidents in our community – and with more and more people texting and being distracted while driving, I believe we need to invest in more off-road routes. – American Tobacco Trail signage: Being a heavy user of the American Tobacco Trail and the routes west of 55, I’ve seen a number of near misses in that area. I also think we could do a better job of signage, so direct people to park at the trailhead, rather than on O’Kelly Chapel road. – Louis Stephen road to Little Drive – the access to the back of Parkside Town Commons is blocked right now for 1 main reason, and that’s while we wait for approval for the railroad crossing (while we close another one, which will be very soon.) That will provide the extension of O’Kelly Chapel, to Little Dr. What we’ll need next, is the extension of Louis Stephens to Little – and that road is in 3 jurisdictions, a small bit in Cary, some in Morrisville and the rest in RTP. So that might take awhile. 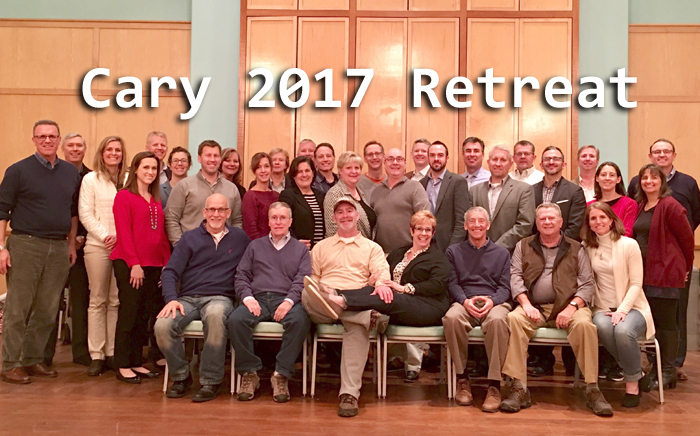 So, long long post, but hopefully you got an idea of what your Town Council and Staff review, as we move forward to continuing to keep Cary a remarkable community.